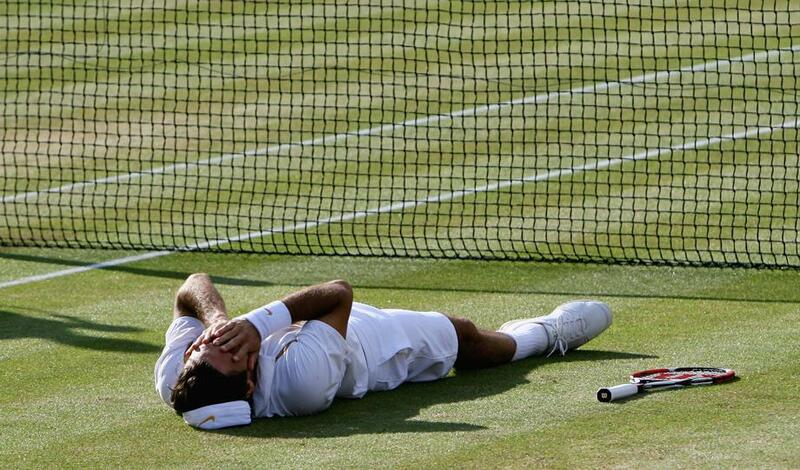 Wimbledon celebrations: The best photos of tennis players throwing themselves to the ground in triumph. 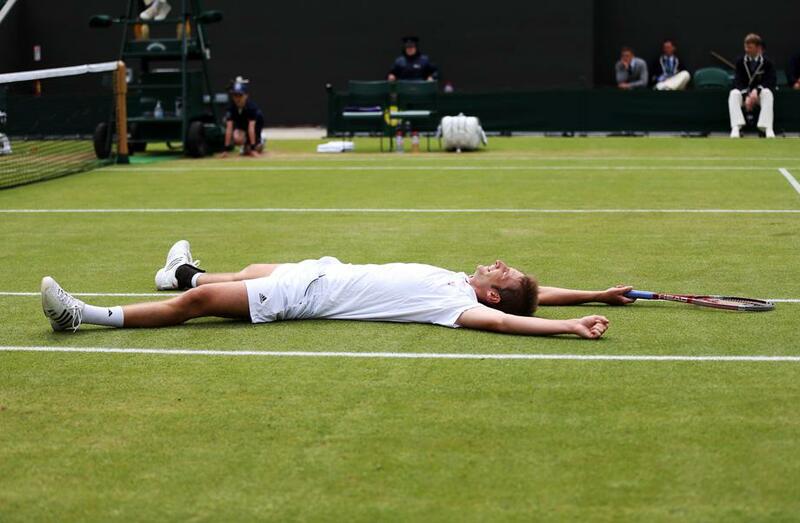 The best photos of tennis players throwing themselves to the ground in Wimbledon triumph. Some people watch Wimbledon to see the world’s best tennis players compete on the sport’s grandest stage. Others tune in to see something more specific: the celebratory flop to the ground. 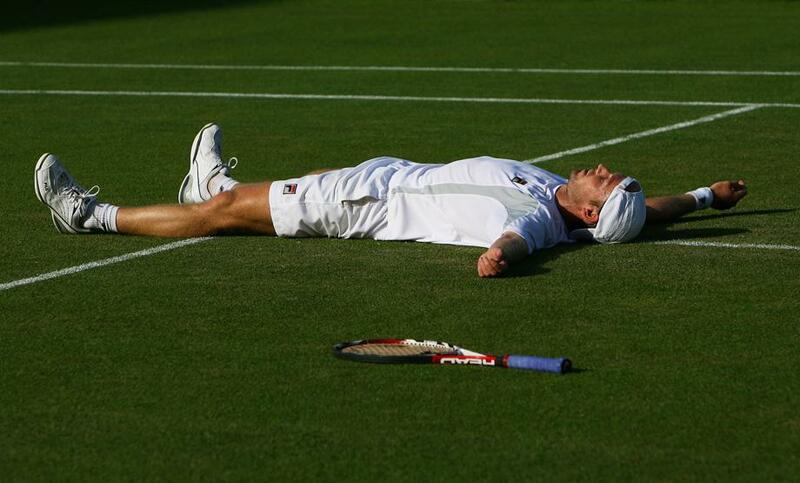 As the 2012 tournament wraps up, we take a look back at some of the greatest—and some of the most awkward—championship collapses in Wimbledon history. Although the motivation for the flop is not always clear—Is it performance art? Is it simply physical release?—it is evident that some players are better hit-the-grassers than others. The following moves are rated on a 10-point scale. Photo by Clive Rose/Getty Images. Florian Mayer set the bar high this year with this understated masterpiece in parallel limbs. After his fourth-round win against Richard Gasquet, the German player’s legs and arms make perfect contact with the ground. His clenched fist and ecstatic smile tip the scale. Great all-around form! Score: 9.5. Photo by Glyn Kirk/AFP/Getty Images. After winning his first Wimbledon title last year, Novak Djokovic took Wimbledon celebration in a startling new direction. 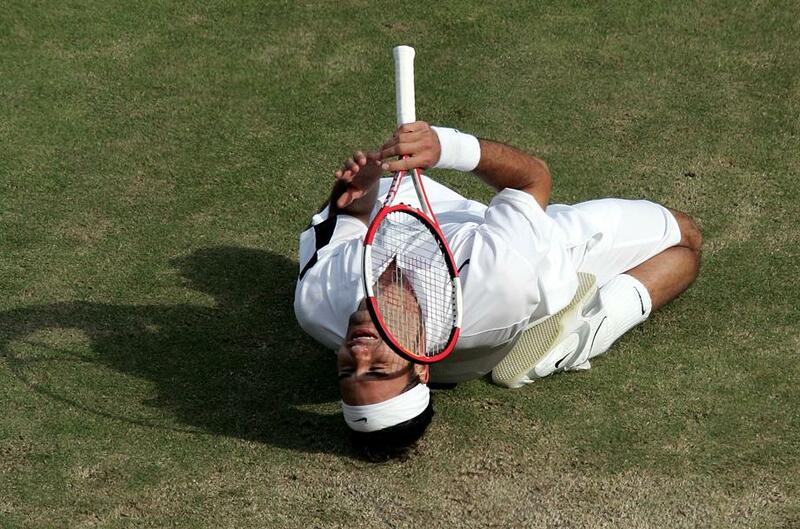 Djokovic not only lowered himself downward, but also ate the grass beneath him. When asked about his motivation, the Serbian declared, “I felt like an animal. I wanted to see how it tastes.” Score: 9.3. Photo by Stephen Pond/Pool/Getty Images. 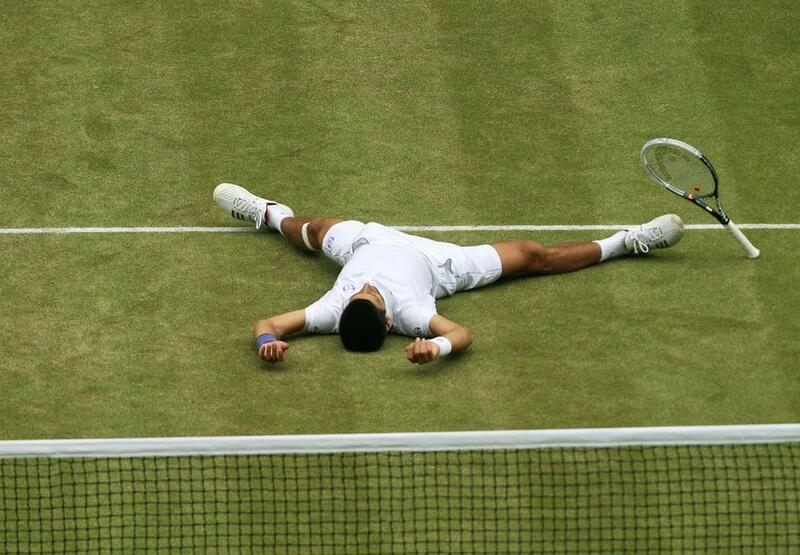 Moments before he ate grass, Djokovic perfected the full body flail. Additional points are given for artful racket positioning. Score: 10. In the 2011 semifinals, Djokovic and Jo-Wilfried Tsonga both hit the ground on account of exertion, not celebration. At the end of a grueling point, won by Tsonga with a diving volley, both players found themselves sprawled out on the grass. 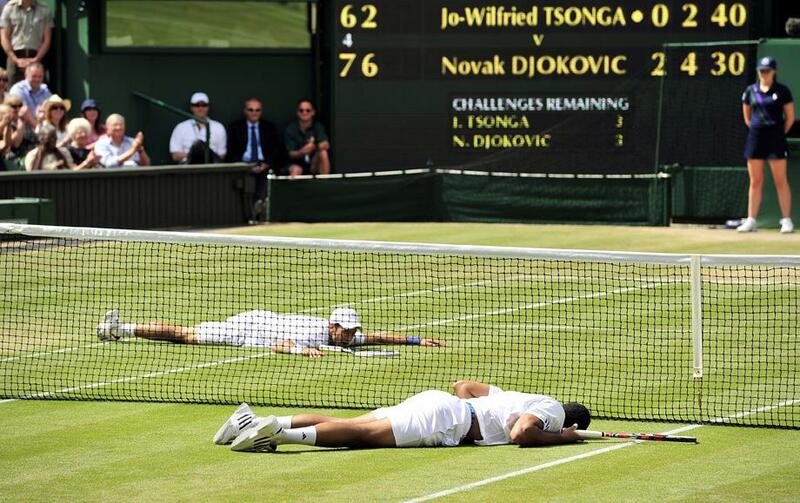 As far as form goes, Djokovic’s head could be down further and Tsonga’s arms further out. But with such precise timing, those are mere quibbles. Score: 9.5. 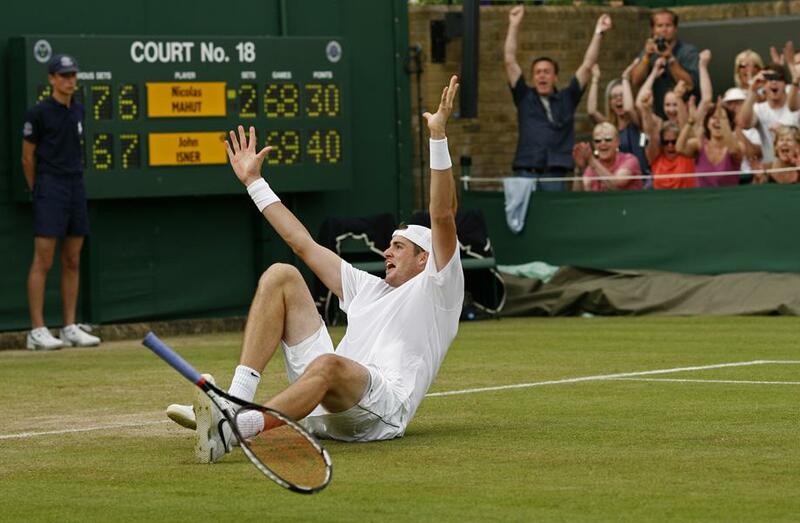 John Isner had the right idea when he dropped to the ground after winning his record-breaking 11-hour match against Nicolas Mahut in 2010. The racket is well-positioned and those jazz hands definitely help boost his score. Still, his body is contorted and he has little control over his torso and legs. Score: 5. Jurgen Melzer and Philipp Petzschner. Photo by Matthew Stockman/Getty Images. Jurgen Melzer of Austria and Philipp Petzschner of Germany offer an intimate twist on the celebratory flail after winning the 2010 men’s doubles title. The intertwined legs add a sweet new dimension to this form. Score: 8.5. Photo by Clive Brunskill/Getty Images. Rainer Schuettler of Germany shows near-perfect collapse form after his fourth-round win over Janko Tipsarevic in 2008. Both his legs and arms are spread far apart, nose to the sky in a classic sprawl. His racket is a standard arm’s length from his body, showing attention to detail. Score: 9. Roger Federer, who is going for his record-tying seventh Wimbledon championship on Sunday, has often struggled with conveying joy. He was off to a good start in 2007, but then he undermined his move with a distraught hand motion. Score: 4. Richard Gasquet draws upon the classic hands-to-the-head move after beating Andy Roddick in the 2007 quarterfinals. His arms are bent and cover his face, resulting in subpar overall form, although joy is sufficiently radiated. Score: 6.5.
Credit: Ryan Pierse /Getty Images. Marlon Bartoli drops into a prayer-like position after advancing to the 2007 women’s final. Bartoli falls into the same low-commitment trap as frequent non-supine celebrant Maria Sharapova. If you are going to hit the ground, you might as well go all the way. Score: 3.5. Photo by Phil Cole/Getty Images. Federer’s full back bridge in 2004 leaves us worried for his vertebrae. He also appears on the verge of slapping himself in the face with his racket. Score: 2.